Saeed Jaffrey. Roshan Seth. Daniel Day Lewis. Gordon Warnecke. Shirley Ann Field. Drama. Guardian 1000 Must See (2007). Art House. 01 Adam's Faves. Gay Interest. BFI Top 100 British Movies. Recommended. This is the story of a young Anglicised Pakistani and his erstwhile fascist ex-schoolmate, Johnny. 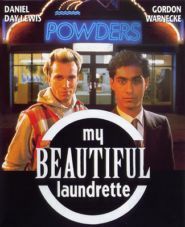 Together they run a dilapidated laundrette, given to Omar by his rich uncle, and decide to turn it into a veritable palace, despite the hostility of Johnny's skinhead friends and Omar's cousin.